Noblesville Mayor John Ditslear is pleased to announce that the Indiana Arts Commission has named the city to the Indiana Statewide Cultural Districts Program. The statewide designation will provide recognition to advance Noblesville’s emphasis on the creative community and the arts as it related to tourism, downtown revitalization and preservation. Noblesville joins fellow Cultural District communities of Bloomington, Carmel, Columbus, Lafayette, Madison and Nashville, each known for their strong arts and cultural appeal. The recent decision also makes Hamilton County the only county in Indiana with two designations. “Hamilton County has created a regional draw through the support and high importance our communities have placed on cultural arts and making artistic outlets and attractions,” Mayor Ditslear said. The Noblesville Common Council established the city’s cultural arts district recommendation from the Noblesville Arts Council in August. The district goal was two-fold: capture as many cultural arts assets as possible, and keep the size of the district manageable. The district includes the city’s newest cultural amenity and public park, Federal Hill Commons which will anchor the west side of the downtown and the Cultural Arts District with an amphitheater nestled against the White River. The district also stretches into the residential area considered “Old Town” to capture Logan Street Sanctuary, local artist residences and in-home studios and Seminary Park. 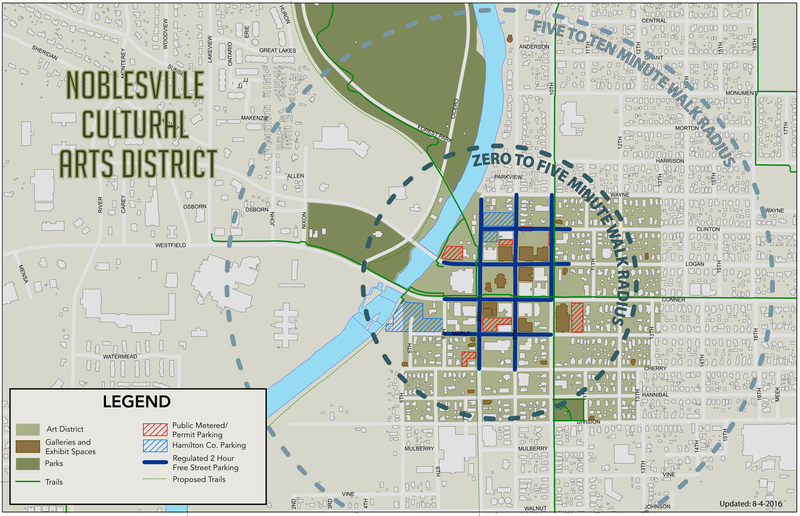 Noblesville Economic Development Assistant Director Alaina Shonkwiler said the residential area is crucial to the distinct, creative character of the district and to sustain a strong, lasting connection to the community. The district encompasses approximately 50 square blocks in downtown Noblesville. The district designation impacts more than just the arts industry as it makes Noblesville a more vibrant community and attracts residents and tourists who also support adjacent businesses such as restaurants, lodging and retail. While the official designation of the Noblesville Cultural Arts District does not come with public funding, it gives Noblesville a statewide platform to share the importance of local arts and culture as a key component of local economic development, tourism, and quality of life. For more information about the Indiana Statewide Cultural Districts Program, contact Paige Sharp at 317-232-1279 or email psharp@iac.in.gov. An overview of the program may be found online at www.in.gov/arts/2654.htm.